Sciblogs | The academic publishing scam – how much research funding are we losing to journal subscriptions? The academic publishing scam – how much research funding are we losing to journal subscriptions? If you are in Australia or New Zealand and want to know how much is spent just on purchasing subscriptions to academic journals then there is a very handy tool on the Council of Australian University Librarians website. In 2013 New Zealand’s universities spent $51,135,180 on journal subscriptions. That’s just our universities, so doesn’t include our CRI’s or independent research institutes. $51,135,180 to access work funded by the tax payer published in pay-walled journals that rely on unpaid labour by university academics for peer review and editorial duties. To put that figure in perspective, the only funder of investigator-led blue-skies research in New Zealand, the Marsden Fund, awarded $59,000,000 in funding in 2013 – enough to fund 109 projects for 3 years. In other words, we spend almost as much on buying access to research as we spend on blue-skies research. I vote we scrap the subscriptions and use the money to double the Marsden Fund, giving each project an allocation to publish their results open access. Makes sense to me! Hat/tip to Alex Holcombe (@ceptional) and Fabiana Kubke (@Kubke). This kind of things has been recognised in economics for a while now.See this page http://www.econ.ucsb.edu/~tedb/Journals/jpricing.html by economist Ted Bergstrom at UCSB. As Ted asks “Why are we doing free referee work for rogue journals that skim huge profits from our research budgets and restrict access to libraries at the richest universities?”. That’s an obscene amount of money spent on subscriptions if it is accurate, which presumably doesn’t even include individual subscriptions – many society memberships offer a (discounted) journal subscription – and publication costs such as payments for colour photographs, etc. However, this money is paid form a completely different budget than, say, the Marsden Fund. What you seem to be suggesting is that the academic institutions would receive less funding from the government so that the Marsden Fund can fund more (<100?) projects, each with a small allocation for publishing in Open-Access journals. If all subscriptions are cancelled how would we access these journals? We would still have to read and cite the vast number of peer-reviewed papers in these non-Open-Access journals, wouldn’t we? As usual, I seem to be missing something. The idea is that we wouldn’t need to access the journals. A growing number of overseas institutions and funding bodies now have mandates that their research has to be available, either in a repository or published open access. Unfortunately New Zealand is dragging behind on this. 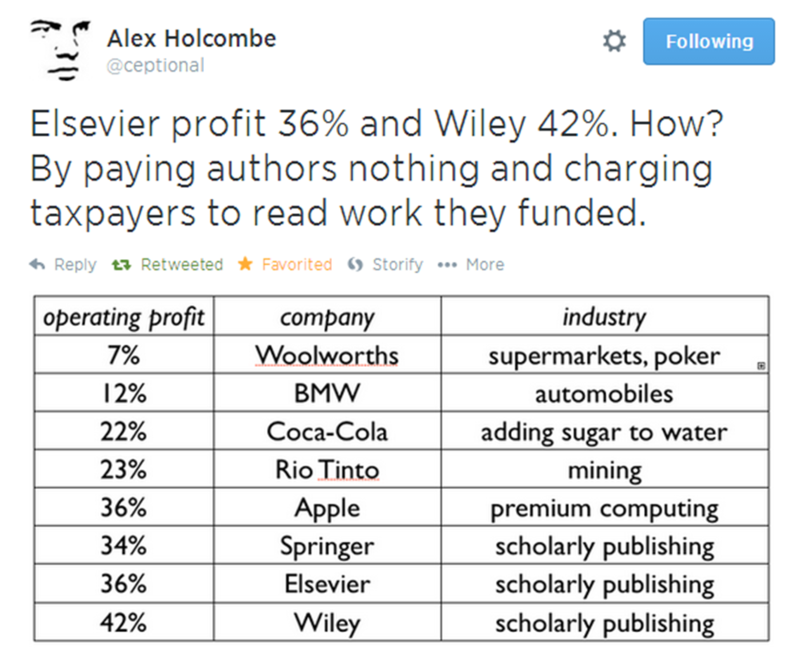 It would be good to have some figures on how much the Open access journals charge scientists to publish their work. In some cases they charge up to $3000 to publish something which is not even printed on paper anymore!. I think Open access model has merit but for scientists it does not make much difference. In subscription based journals the institution or organization pays to access the journals, in open access journals – organisations pay individual research programs to get their work published. The bottom line is that publishers do not lose money. Do you know that BioMed Central (or BMC) the biggest open access publisher is owned by Springer! !